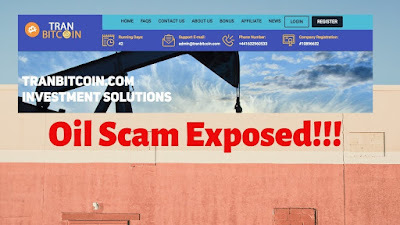 The company claimed on their website that "tranbitcoin.com is a registered company that deals with major oil producing corporations & cooperatives involved in oil operations.We work with five-star suppliers & subcontractors.tranbitcoin.com register Under companieshouse #10896632.We offer Investment services in Oil Minning.This program is open for foreigner Investments where all over the world people make Investment and Enjoy Profit.We accept Perfect moeny , Payeer , Advcash , Bitcoin , Litecoin , Ethereum . Dashcoin , Bitcoin cash to make Investment in our Company.We Provide 100% Money Back Guaranteed with Profit." But fall for it. Its a total scam. The registration certificate is fake and according to whois.com the site is registered in panama not Uk and the details of the owner is hidden so you can't trace them. In fact, btcclicks.com is where he use to get his victims. 99% of adverts on btcclicks.com are scam.